(Review by Ann Alex/photos courtesy of Liz Armstrong). 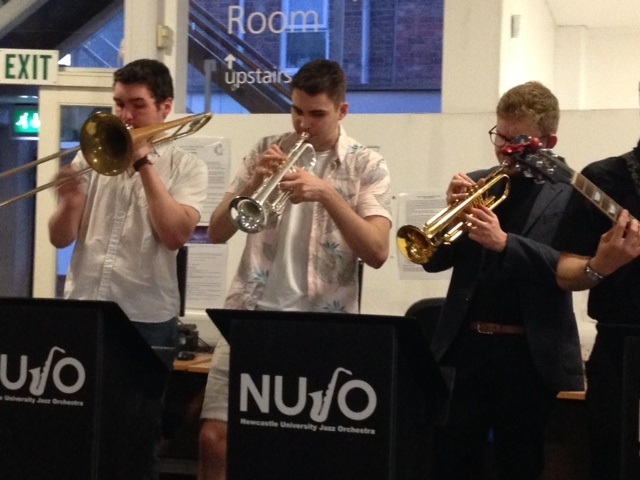 Part of the Jesmond Festival, which is in full swing, especially at last night’s jazz do which took place in Jesmond library. The library was saved from closure by the efforts of the goodly people of Jesmond, who took it over as a community project. As Joe Davies commented, ‘This is ironic that we should be playing for pleasure in a library, where we are usually studying’, or words to that effect. This was just some members of the band, as students are currently busy with exams and we were lucky to have the bass guitarist, who had risen from a bed of sickness. They began with Miles Davis’ Solar, with trombone on the first solo of the evening, a little unsteady until he hit his stride, then it was all systems go for the rest of the gig, with some clapping along from the audience during the later numbers, and some fine playing, as you’d expect. 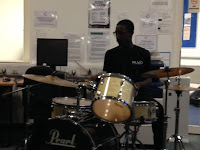 Coltrane’s Mr P C followed, call and response from the two trumpets and a cute vibrato effect from Mr Davies, and an early drum solo. All of Me, (number 20 in their pad); and a smooth Misty with brushed drums from a drummer who is one to watch. A fast Autumn Leaves with a skilled sax solo. It was good to hear Davis’s classic So What to open the second set, with solos from nearly everyone and small interjections from the others. Is this what they call noodling? It works, anyway. Joe then introduced what he called ‘lift music’ – Girl from Ipanema, then we clapped along to a muted trombone on Blue Monk. During Four, sax, trumpet, and trombone seemed to be doing not 4’s but 1’s. An enjoyable evening’s jazz was rounded off with It Don’t Mean A Thing and the protest number I Wish I Knew How It Would Feel To Be Free, with final lively solos from all except bass and drums.